This poem by the great Turkish poet and exile Nazim Hikmet seemed just right for this sun-heavy Thanksgiving Saturday on Vancouver Island. Here, on a day when Autumn, in its riot of colours, is still a consolation and not the desolation it can be when the rain and gray skies move in. And it seemed just right for a day when all the stock Autumn images seem to trap me in one wonderful cliché after another. What a challenge for a writer to come at this season in an unexpected way! That’s why I so appreciate how Hikmet tackles the cliché of falling leaves head on; and how he, wonderfully, gives us this fifty one thousand and first poem on falling leaves. And gets away with it. Such a lovely reversal he pulls on the reader. Once he deals again and again with his list of fifty thousand instances of reading about, watching and stepping through falling leaves his line: but I’m still touched by falling leaves seems such a welcome surprise. For me, that surprise earns Hikmet the right to be writing yet another “falling leaves” poem and I am pulled in and then drawn in even further by his conditional phrases that start with especially. These phrases add such resonance and poignancy. And his repetition of especially creates the momentum that drives the poem forward so successfully. And something else. What becomes clear towards the poem’s end is that his being touched by falling leaves is so specific to a time and place. In September in Leipzig. I can imagine him walking down a boulevard, lined with chestnut trees. It is sunny, children are playing and life seems pretty good on a day where he believes his love loves him and he feels good about people! 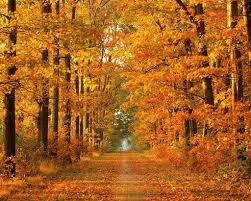 All this is a wonderful opposition to the usual metaphoric sense of sadness or loss evoked by falling leaves. So, on a day of thanksgiving here in Canada I give thanks for this poem and for Hikmet; and especially for how he reminds me, on this beautiful day, to see falling leaves as a consolation not as a desolation. This entry was written by Richard Osler, posted on October 12, 2013 at 8:16 pm, filed under Poetry and tagged Falling Leaves, Nazim Hikmet. Bookmark the permalink. Follow any comments here with the RSS feed for this post. His dates place him as a slightly younger contemporary of the great Turkish Muslim scholar Beduzziamin Said Nursi (obit 1960). Nursi spent 28 years in prison or internal exile. Do you know if he knew of Nursi? Richard, there will never be too many poems about leaves! Thanks for another. I remember a long time ago reading by George Bowering and I thought he spoke this line: “leaves are heartache gathering at doors.” Even if he didn’t say it quite the same, I still love it. 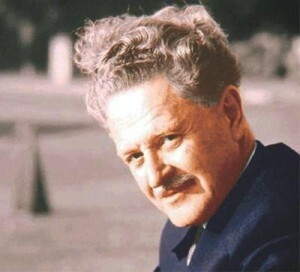 Thank you for introducing me to Hikmet. I’ve now ordered his collected poems. What I find so interesting about his work is his narrative style though it doesn’t feel narrative-like at all. He enters the poem in a manner that disarms me, as if we’re walking along a treed boulevard in Leipzig having a conversation. Dear Heidi – I think you are on to something. This poem is a great example of Hikmet disarms us with his “easy” conversational cadence while giving us much more than lineated prose! His use of anaphora and other repetitions chains this poem together and I can swing from it like a kid under the boughs of an over arching tree! Thank you for your love and passion for poetry!